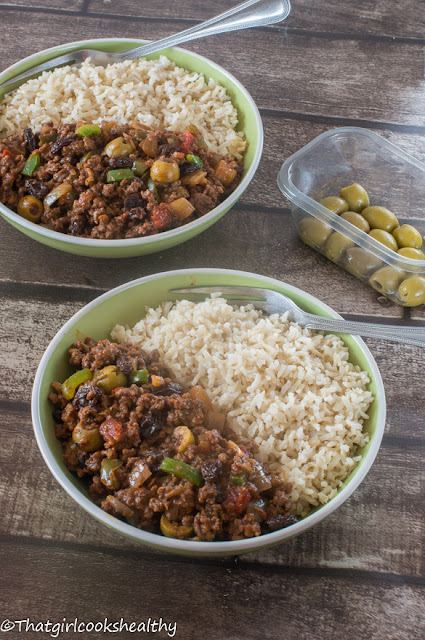 Cuban style picadillo was one of those unforgettable recipes, the flavours were bold and the meat generously seasoned – just how I like it, no complaints from me. I made a pledge to myself that I would make my own rendition and try to do the traditional recipe some justice. Picadillo is actually a Spanish cuisine that was brought to the Spanish colonies including Puerto Rico. Similar to the other Caribbean islands, each island has their own version of how to make this wonderful dish. My version of this Cuban style picadillo has its own adaptation to suit but these are modifications that don’t stray too far away from the traditional recipe and using ingredients that you will most likely have in your pantry/spice rack. As with many Latin American dishes, sofrito which is an aromatic sauce consisting of bell peppers, onions, tomatoes, garlic and herbs form the base of almost any dish, so this what will need to be prepped before browning the ground beef. Start by placing the ground meat in a large bowl. Use your hands to work in the adobo seasoning. Really work the dry rub in by breaking down the slab of minced beef then set aside. Melt the coconut oil in a large skillet/pan on medium heat, then add the onions, garlic and bay leaf and sautee for 1 minute. Add the beef and proceed to seal and brown the meat with the other ingredients. This should take 4-5 minutes. Once the meat has darkened add the green bell pepper then pour in the chopped tomato and evenly coat the minced beef in the sauce. Sprinkle the cumin, oregano and parsley into the pan and stir. Add the raisins and olives to the pan again, giving another good stir. Finally pour the red grape juice to the entire pan and bring to a rolling boil before reducing the flame to low. Cover the pan with lid and simmer for 15-20 minutes (checking periodically). 0 Response to "CUBAN STYLE PICADILLO "